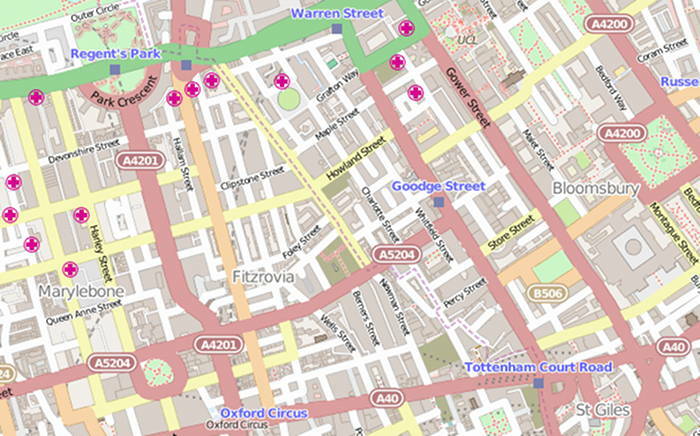 There were 10 planning applications validated in the Westminster part of Fitzrovia between 16 and 28 February 2015. Approval of details pursuant to Condition 16 (ii) and (iii) of planning permission dated 30 November 2012 (RN: 12/09511), namely the submission of detailed drawings of all new staircases and ladders in the front basement areas and all new railings. Approval of details pursuant to Condition 8 of planning permission dated 30 November 2012 (RN: 12/09511/FULL), namely, the submission of a supplementary acoustic report. Variation of Condition 2 of planning permission dated 8 May 2014 (RN: 14/02391) for the ‘variation of Condition 4 of planning permission dated 02 May 2012 (RN: 12/01909) for the placing of three tables and 12 chairs in two areas measuring 2m x 1.8m and 3.4m x 1.8m namely, extension of temporary permission for a further period of two years until 31 May 2016’, namely, to allow the tables and chairs to be placed on the public highway from 07:00 daily. Amendments to planning permission dated 7 November 2013 (RN: 13/03339) for alterations including erection of a fifth floor mansard roof extension and installation of new and replacement windows to the rear, creation of roof terraces and use of the first to fifth floors as eight flats (Class C3). Alterations to the Great Portland Street, New Cavendish Street and Bolsover Street elevations including the alterations and replacement of windows, installation of new shopfronts and the creation of a new entrance in connection with the provision of additional retail floorspace to create two shops (Class A1); installation of plant. (Site includes 136 and 138 Great Portland Street). Namely, revised flat layout at fourth and fifth level resulting in minor changes to buildings (North Elevation). Installation of replacement windows at all floor levels on the front and rear elevations of the property. Reconfiguration of ventilation grilles to the Clipstone Street elevation. Amalgamation of 55 and 57 Great Portland Street to provide public house or restaurant use (Class A4 or A3 dual/alternative use) at basement, ground and first floor levels, and residential use (3 x 2-bedroom units) (Class C3) at second, third and fourth floor levels. Associated internal alterations and external works including realignment of roof line to No. 57, alterations to shopfront at No. 57, installation of plant within enclosure at rear first floor level and roof terrace at rear second floor level. Use of basement, rear ground, front first, second and third floors as 3 x flats (Class C3), including the installation of a replacement lantern skylight at rear first floor level, installation of replacement windows and doors, and associated alterations.